President Emmanuel Macron says France will not allow a new migrant camp to be set up in Calais, on a visit to the port where many gather hoping to get to the UK. Up to 700 migrants are in the area, despite the camp known as the "Jungle" having been dismantled in 2016. He also defended his immigration plans that have been heavily criticised. On a visit to Britain on Thursday, he is expected to demand the UK government do more to help. 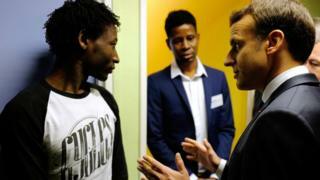 On his first official visit to Calais, Mr Macron met migrants and groups working with them, as well as residents and local authorities who have called for more measures to prevent another large camp from emerging. Two groups refused to meet the president in protest at strict measures used by the French police against migrants. The Calais "Jungle" became the French symbol of the European migrant crisis, and some 7,000 people - most from the Middle East and Africa - were living there before the area was cleared. "In no case will we allow another Jungle here," Mr Macron said on Tuesday, adding that the illegal occupation of public spaces would not be tolerated. France received a record 100,000 asylum claims in 2017, making it one of the main destinations in Europe. The president is expected to unveil a new migrant policy next month, which will include speeding up the application process for asylum seekers and faster removal of those who fail to be accepted. But charities and even some of his allies have accused the government of taking a hard line on immigration. As a result, undocumented migrants barred from entering the UK stay in France - many in makeshift camps. President Macron is facing an immigration challenge. His government is about to unveil a new immigration law with some tough provisions that have caused anger among human rights organisations and some disquiet even among the ranks of Mr Macron's own En Marche deputies. 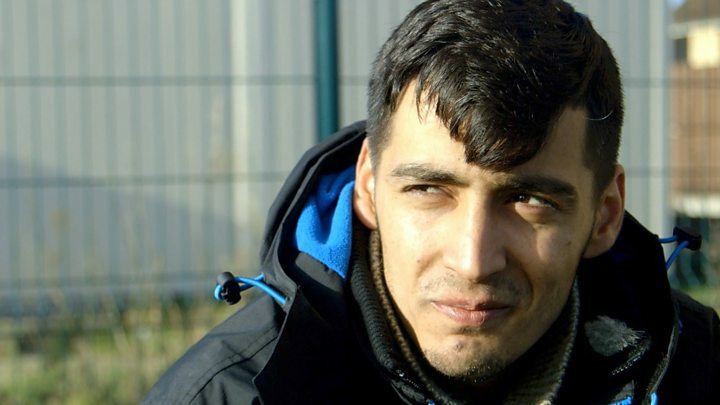 He says the right of asylum in France is not under threat, but as he promises never to allow another "Jungle" camp in Calais, he is looking to the UK to help resolve this region's long-running migrant crisis. He wants more money and a British willingness to take more migrants, especially unaccompanied minors. Strictly speaking, tweaking the terms of the 2003 Le Touquet treaty has nothing to do with Brexit. But Mr Macron knows that Theresa May needs all the help she can get from sympathetic European leaders in the coming months. That, he may be thinking, gives him some leverage when it comes to fixing the problem of Calais. Mr Macron will demand the UK do more to help ease the migrant burden when he meets British Prime Minister Theresa May, French officials say. He will ask the UK to allow in unaccompanied children and adults with family members already in the country and more money to help with border security. A spokesman for Mrs May said: "We've taken a significant number of unaccompanied asylum seeking children from the area around and in Calais already."